The Executive Towers is a complex of 12 towers in Business Bay in Dubai. They comprise ten residential and one commercial tower called Aspect Tower, and one hotel apartments called The Executive Hotel Tower. 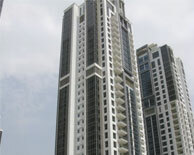 These are the first buildings to be completed in Business Bay, and located near to the entrance. A three storey podium connects all these towers as well as to the nearby Vision Tower, which is going to be connected by a special passage.The first two levels of the podium comprise Bay Avenue shopping mall with retail space of 175,000 square feet and water front terraces.The third level is called The Courtyard, it contains landscaped plazas,communal facilities, , children’s play areas, fountain courtyards, yards and covered walking arcades.